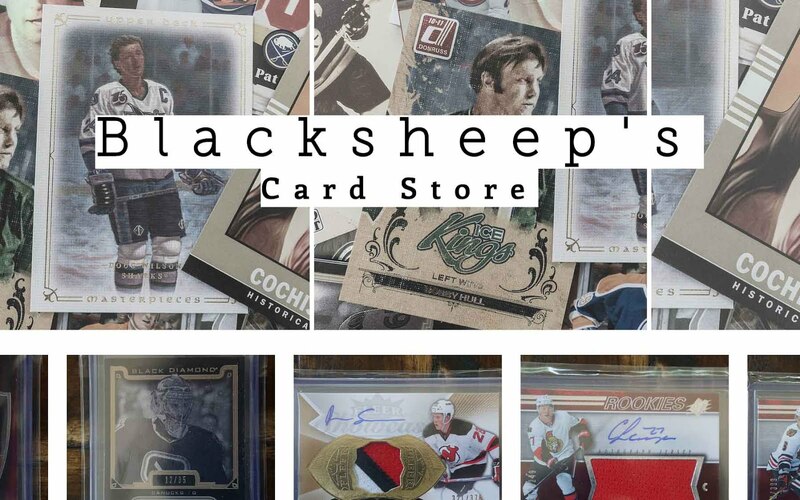 It's been over a month since Upper Deck released its last product, but the wait is now over! Ultimate Collection has reached hobby store shelves to the delight of high-end hockey card collectors. Ultimate Collection is a high risk, high reward product that is very pricey for the amount of product you actually get. Let's see if fortune favors me with the box that I bought for this review. The base cards for Ultimate Collection are pretty interesting. The standard veteran players are limited to just 99, so getting a base card isn't as common as purchasing a pack as my pack didn't have a veteran base card. These cards are actually kind of rare in comparison to the rookie cards that Upper Deck has jammed into the product. Usually it's the rookies that get the limited treatment - Ultimate Collection flips that concept on its head. The rookie cards in the main set come in a variety of variations. An acetate version of the rookies are Ultimate Introductions. These rookie cards are done in acetate and have that smooth glassy sheen across the surface. Just as in most Upper Deck products, the players are placed into tiers. Top rookies like Auston Matthews are more difficult to pull. My pull in the pack, Alan Quine, was one of the easiest to get. The second type of rookie card is the Ultimate Rookies set. 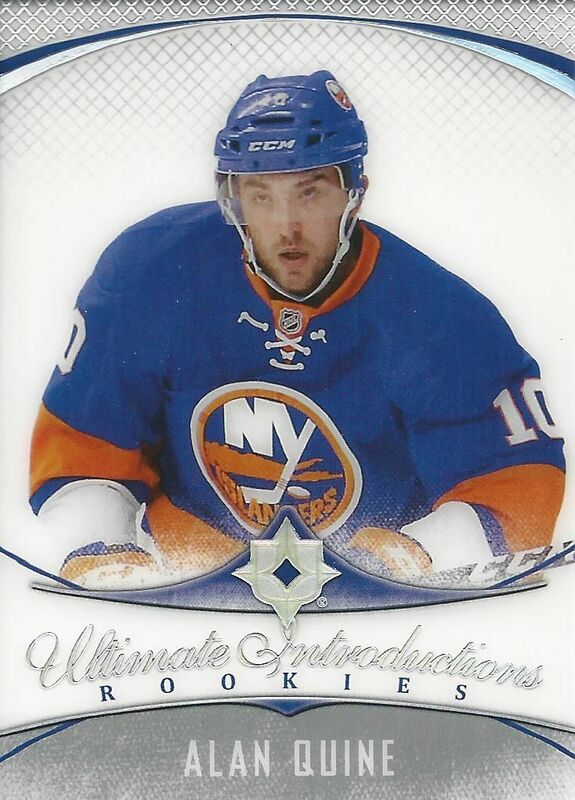 This is the more familiar rookie card out of Ultimate Collection. 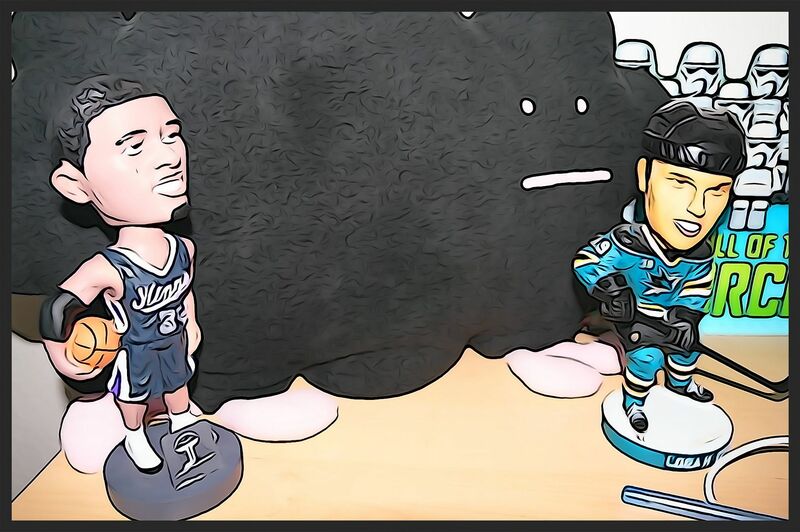 The rookie cards come with a hard-signed signature or various versions of jersey pieces. As always, the nice thing about Ultimate Collection and the other high-end Upper Deck products is that the cards are hard-signed rather than a sticker autograph. This year's Ultimate Rookie Auto looks great as the grey tones give the cards a more serious look. The Ultimate Rookie Autos are separated into two types. Most Ultimate Rookie cards are numbered to 299, but the best of in class have just 99 copies each. Know what you're getting into when buying Ultimate Collection. The sell sheets will have some pretty spectacular cards to see, but remember that each pack of cards will only yield about 4 or so cards. My pack had all cards from the main set save one. 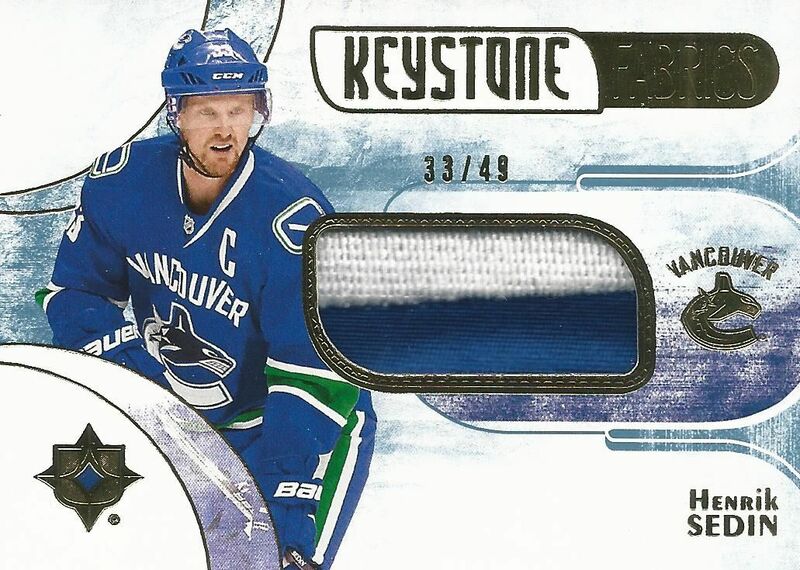 The one card that wasn't from the main set was this Keystone Fabrics card of Henrik Sedin. It's a medium/small patch card numbered to 49. This was defintiely the 'hit' of the box/pack for me, and it was pretty disappointing. Sedin is not a hot hobby star and this card isn't even that limited in today's market. I'm sure if I wanted to find this card on eBay, it could have it for just a few bucks. But that's the game you play when you dip into products like Ultimate Collection. Select few collectors will find the real goods in packs. Patch autos and NHL shield cards are the main draw of this set. The rookies numbered to 99 are also card that are highly sought after. But other than that you'll be hard pressed to find anything that really gets you your pack price back. 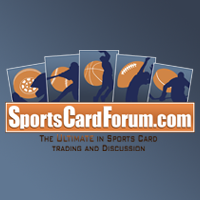 In the end, Ultimate Collection is for the high rollers of the hockey card collecting world. My break of the product was pretty mediocre, but I knew what I was getting in to, so I'm not mad about it. I would say there are plenty of other products out there that would yield much better results. If you do have money burning a hole in your pockets though, rather than buy packs of Ultimate Collection... get it by the case. That way you at least are guaranteed the case hit. Usually those are pretty decent pulls. Nice reveiw Luke! I think ultimate collection looks very nice this year, but it's a hit or miss product. Cool review and nice box! Just like every other premier upper deck product... a rip off for what you for it. While I love Ultimate.. I agree it is a hit or miss product. Some boxes are maybe $60 yet hit this years rookie class and you can pay off your car. I really like ultimate collection, but it's a lot of money and sometime the cards that you get are bad and good. Nice video. Tough luck on the cards, another auto would have been a decent box. I wont be buying this because in Canada its $200+ and for that kind of money, its just not worth it. I'll still to buying series 1 and buying single cards. Keep up the great work. Ahoy man, great review as always. That UD Ultimate Collection looked disappointing and not worth the price tag at all. Keep up the good work man and hope you have more better hockey breaks to come! Very good review, loved the video. You got unlucky with your pulls but still fun to watch, I hope you get a decent return on the cards! Good review. Some packs have 5 cards and some 4 cards. Very good review. Agree with most of what you said. The autos look nice but as you said, Go big or go home. The product is a little overpriced. To bad it can't have at least one big name player per pack. Great review as always but sharing a similar disappointment with the end result of the break. 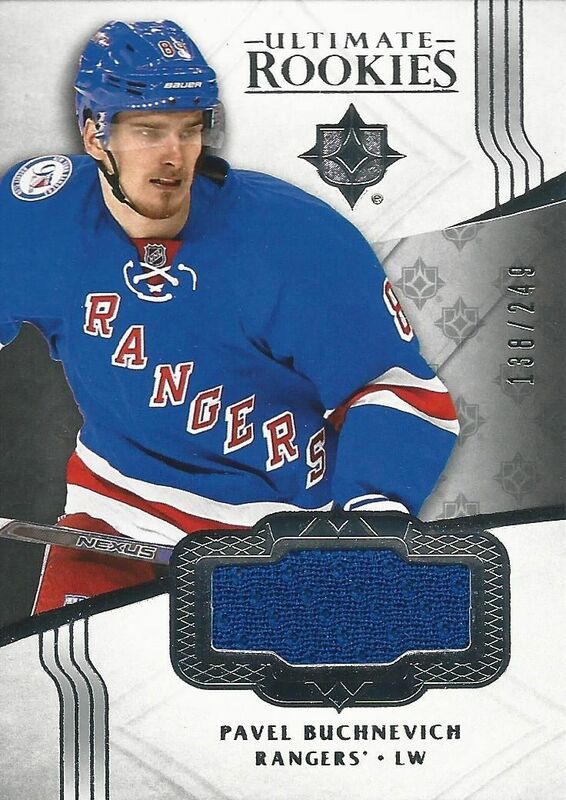 It's a nice(r) 2 colour patch on the Henrik Sedin /49, but as you mentioned, the window could have been bigger. 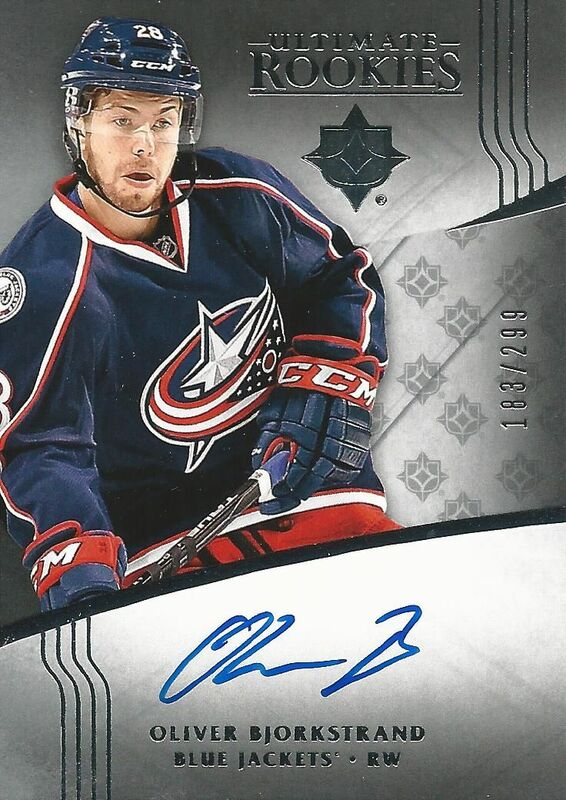 Slight advantage to your particular pull is that it is #33/49, which is the captain's number - #eBay1of1 haha. As a Canucks fan, it would be a nice card to win, if that's the one you choose to give away. Nonetheless, thanks for sharing Luke! Not the best box!! It's all or nothing!! Stillll not a bad product!! Very nice looking cards! Not the best box but that Sedin was nice. Not a fan of Ultimate. It is way to expensive for me atleast in Canada to invest in and get nothing out of it. I did like though how the sedin you got was numbered his jersey number 33. Too bad Ultimate just isn't worth the price nowadays... nice product! Ultimate is too expensive... it's just not worth it, I would rather get a box of series 1 or 2..
+ The grey colorscheme on the Ultimate Rookies auto set. + The Signature/Signature Material Laureates set has a great design. I love it! - The patches on the more common patch cards are small, even though it's such a premium product. Btw, thank you for the card from the Ice contest, which came a couple of weeks ago. Wow, you got scammed! You payed 100$+ and got 20$ worth of cards! Will not recommend this product. I'm iffy. Love the cards. Hate the price. If I were to bet and lose $200 in one shot at the casino I end up with nothing. This way I get to keep something. I like the look of these for sure, but for over 100$ it's really hit and miss. Really expensive for just four cards. I'd say that this product is definitely not worth its price and should maybe include more or better hits. I've been watching your videos nonstop for the past couple day, you have a great channel. I love the target repack videos since I live in Florida that is about the only hockey cards I can get in store.